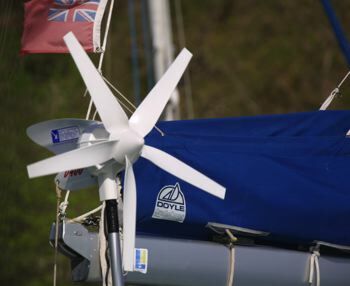 Solar panels and a wind generator provide our electricity without using the twin 56hp Yanmar engines. A water maker produces drinkable water from the sea enabling us to spend longer periods away from land. A generator is aboard to recharge the batteries if necessary. -We have a 12ft Rigid inflatable boat (RIB) with a 25hp Mercury outboard engine. 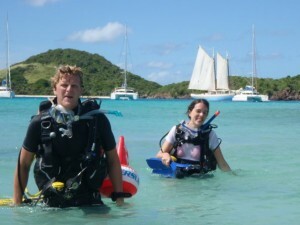 A 2 person kayak is available to explore the islands. -We have a full set of fishing gear for both trawling at sea and for fishing in the bays. -We can charge electric equipment such as cameras, ipods, laptops etc as long as you bring your adapters/leads. We have 110 and 220 volt plugs (USA and UK Plugs) available on the boat but please be aware that power on the boat is limited. 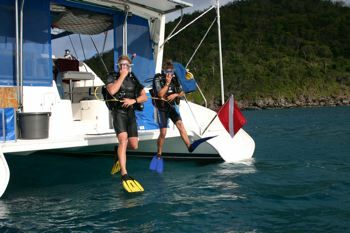 The large swim platform is perfect for easy access into the water with or without diving equipment. A stainless steel swim ladder is mounted on the port hull for help out of the water and a shower allows for easy rinsing of yourself and watersports equipment. There are also two customised stainless steel tank racks on port and starboard of the swim platform. 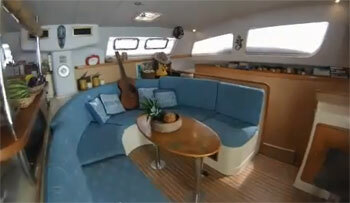 The airy u-shaped Saloon seats 8 to 10 adults comfortably. The varnished beech saloon table converts to provide an additional double bed. 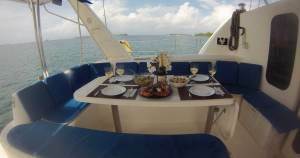 Large windows with fitted blinds provide excellent panoramic views of the Caribbean sea. While ceiling fans and forward port holes maximise ventilation. The cockpit has a large fixed cockpit table with hinged extension which can seat up to 10 people. The cockpit opens up to large swim platform for easy access in to the water. 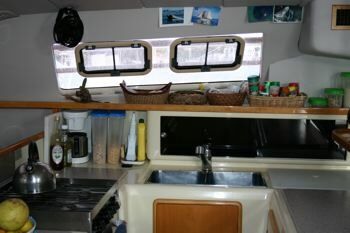 The galley has plenty of space with a four stove gas burner oven, fridge and a large fridge/freezer unit and double sink. Vaza Vezo boasts 4 double en-suite cabins (1 is for permanent use by crew). 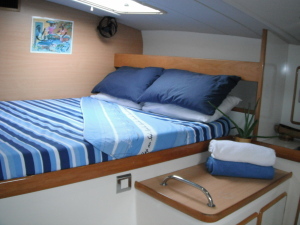 Each cabin features a queen sized bed, overhead lighting, adjustable reading lights, electric fan and ample storage space for your belongings as well as a full length mirror on the cabin door. A large overhead hatch with a blind and numerous port holes provide natural lighting for the cabin plus excellent ventilation. Each cabin has its own en-suite bathroom which contains all amenities including washbasin, shower, marine toilet, mirrored vanity unit, towel rails and shaver outlet. Oxygen is available in case of a diving accident. We also run Emergency First Response (EFR) courses, Primary Care and Secondary Care courses, for those who would like to be trained how to handle an emergency.